What better way to get wedding photos that look like works of art than being surrounded by art? 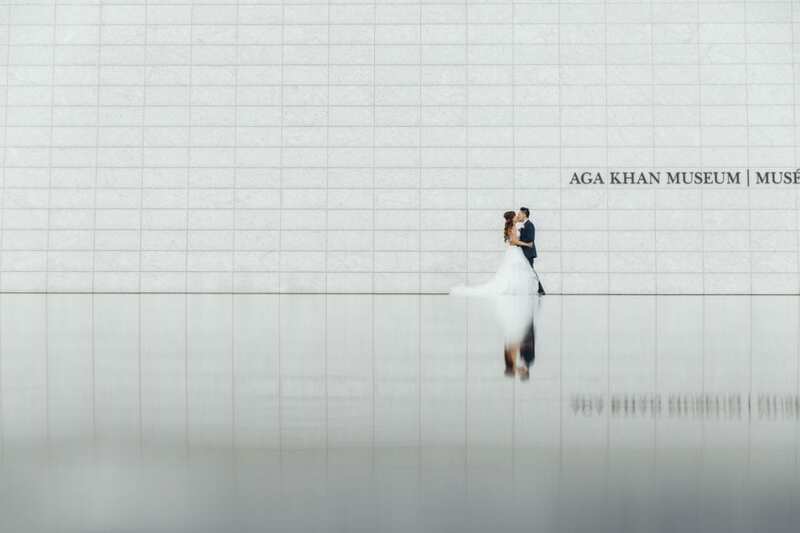 Our Toronto wedding photographers always get excited when we get to shot at the stunning Aga Khan Museum. Located in North York, the Aga Khan Museum (AKM) is the first museum in the western work dedicated to Islamic arts and objects. It features amazing Islamic and Persian art. Even if art or culture isn’t your thing, our photographers guarantee you’ll love having your wedding photos taken here. The AKM is one of the most iconic buildings in Toronto. The modern architecture makes a stunning backdrop for wedding photos. The building features sharp angles, a nice contrast to a flowing wedding dress. The white exterior also means any color dress or suit pops against it. One of the best features at the Aga Khan Museum that our wedding photographers love are the pools outside. 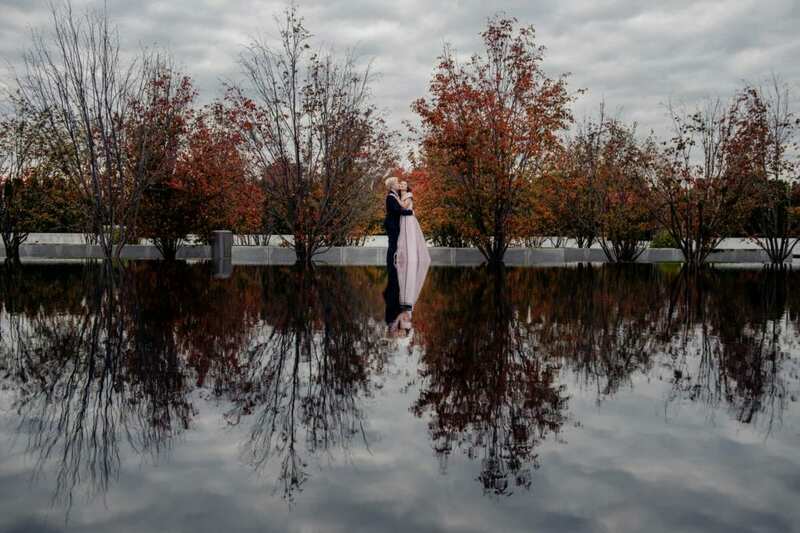 The flat water creates a stunning reflection of both the architecture and happy couple, making for some beautiful photos. The whole exterior landscaped park was created by landscape architect Vladimir Djurovic and is meant to be a contemporary interpretation of the Islamic courtyard the Charbaag. It’s a piece of art by itself. The AKM isn’t only perfect for wedding photos, it’s also a great place to host your wedding. The museum does have space for weddings, both indoors and outdoors. They even have a bridal registry service through their Museum Shop. Couples interested in taking wedding photos at the museum should know that they only allow couples that host their wedding at the venue to take pictures inside. Outside photos can be taken by anyone who fills out a photography permit form. If you’re interested in taking your wedding photos at the Aga Khan Museum, feel free to contact us! Our Toronto wedding photographers love shooting at this location. You can also see some of our past photo shoots shot at this location here!